EXCLUSIVE RIGHTS. 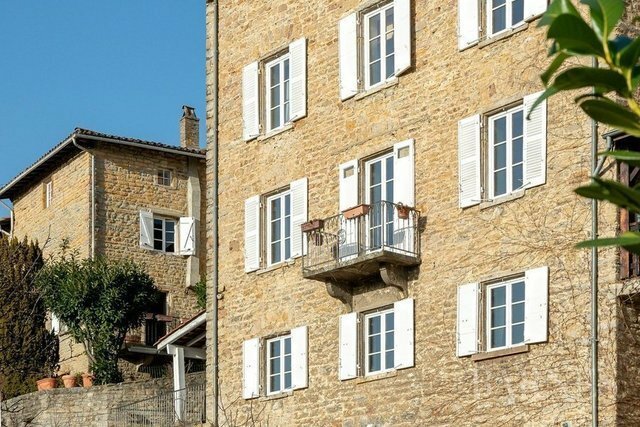 In the privileged site of Saint-Fortunat, serene and unique hamlet perched above Lyon is this beautiful stone house from 1830. The property consists of a main apartment and two apartments. Wood, terracotta, stone, patina and Venetian stucco, these materials from a renovation made in the rules of art create a very warm atmosphere in this exceptional property. The main apartment has about 330 sqm. On 3 levels, it consists of a reception room, a separate kitchen and equipped with Lacanche piano and a desk. The upper floors have 5 bedrooms and 4 bathrooms. In the basement, a laundry room, a beautiful vaulted wine tasting cellar and a garage for storage and 2 wheels complete this property. The other 2 type 2 apartments have independent access. They are classified 4 stars charming guest rooms. Fully equipped, each consists of a living room with kitchenette, a bedroom and a bathroom. One of them enjoys a nice terrace. You are 3 minutes walk from the primary school, buses TCL and Junior Direct and you enjoy an idyllic "as in Provence" with hiking trails nearby. This acquisition is ideal for a business of bed and breakfast or rental short-term high-end.